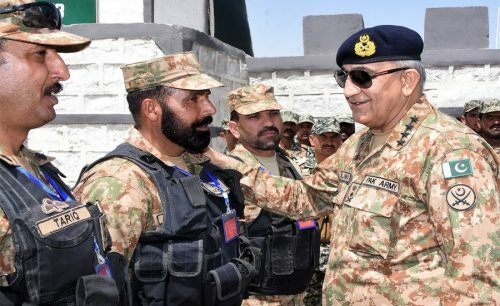 SOUTH WAZIRISTAN (92 News) – Chief of Army Staff (COAS) General Qamar Javed Bajwa visited South Waziristan on Wednesday. According to a press release issued by the ISPR, COAS was briefed about stabilization operations and progress of fencing along Pak-Afghan Border in Waziristan at Angoor Adda. The COAS appreciated quality and speed of work. Later, the COAS addressed a combined Jirga of elders from North and South Waziristan at Wana. Tribal elders thanked the COAS for restoration of peace in the area, merger of FATA with KP and ongoing efforts for socio-economic development in the area. They also assured the COAS for their unflinching support to security forces and the state. They highlighted requirement for additional communication infrastructure, electricity, water, educational institutions and upgraded cellular network facilities. Gen Qamar Bajwa asked all concerned, especially the local population to remain vigilant as main stakeholder to retain attained peace and stability in the area by safeguarding environment from inimical forces who are eyeing to reverse the gains. He said that the suggestions presented by tribal elders are valid and most of them are already included in the mid to long term development plan of the government. The Commander Peshawar Corps and the IGFC KP (South) were also present.